Brand New Worksaver Model SG-26, 3-Pt Mounted, PTO Driven Stump Grinder for Cat 1, 3pt Hitches. * Made for Tractors with 22 to 50 HP. * The SG-26 has a Sturdy 3/4" Thick X 26" Dia, 30 Tooth Cutting Wheel! * Price includes the Base Unit, a 540 RPM PTO Shaft, Hydraulic Hoses & Tips - Complete & Ready to Use! 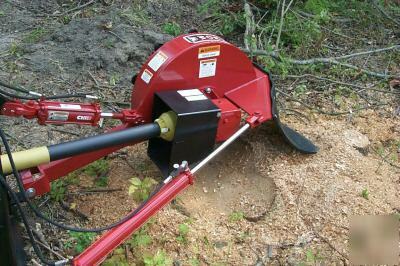 * Worksaver makes a Heavy Duty, Commercial Grade Stump Grinder for a very affordable price! * With a 3-point Mounted Stump Grinder, you get the manuverability of your Tractor. * See the Table below for more Specifications. 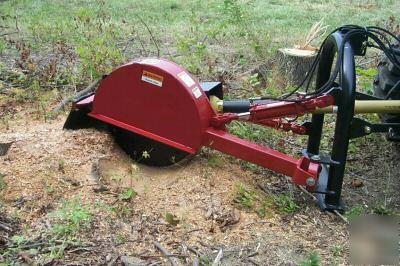 Plus, we are glad to say, these Great Stump Grinders are MADE IN THE USA!! !